Problems with mental health are the number one health issue among Citizens Advice clients nationally and 1 in 4 adults in the UK have experienced problems with their mental health. Citizens Advice research has revealed that there is a link between mental health problems and the likelihood of experiencing problems in other areas such as debt, employment, benefits etc. If you are a local business owner then our clients are your customers…and your employees. 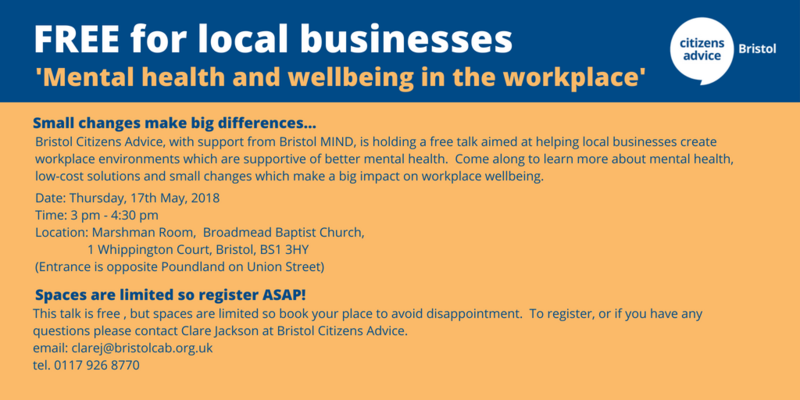 We are holding a talk, together with MIND to look at ways to improve mental health in the workplace. Register for your free place!